If you hadn’t guessed yet, I love gold. 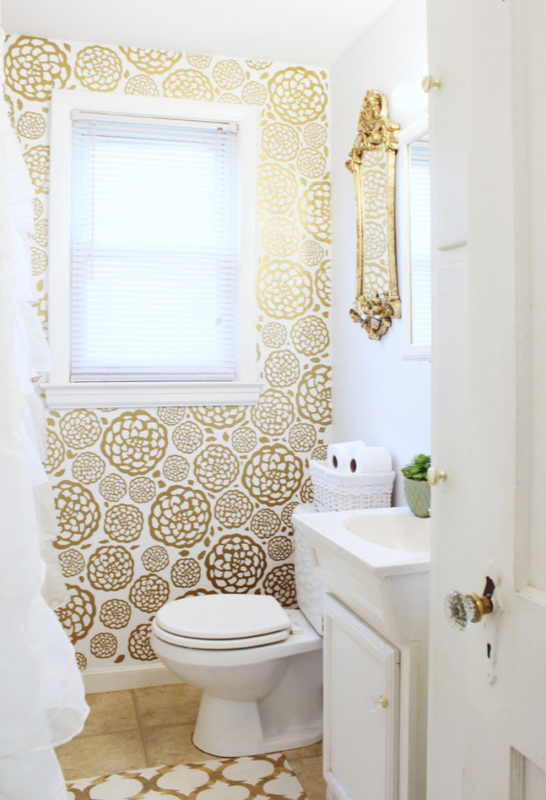 I really love metallic gold anything. I decided the other day that I wanted a gold foil print but I knew what I wanted in my head and didn’t want to go scouring Etsy for someone else’s version of what I had in mind. I remembered I had some printable gold foil in my Silhouette stash and decided to make up my own way of making a gold foil (faux) print. This is isn’t a real print but rather a gold foil decal placed on white cardstock. Here’s what I did to make it. 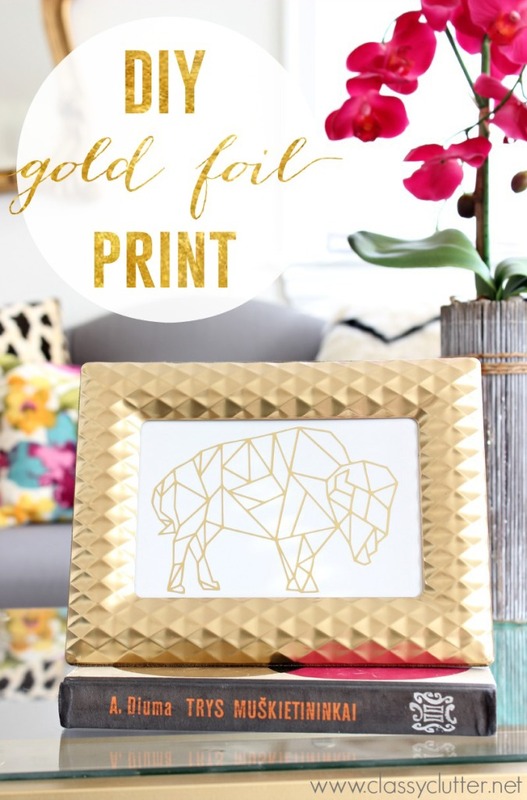 Find an image you want to create in gold foil. 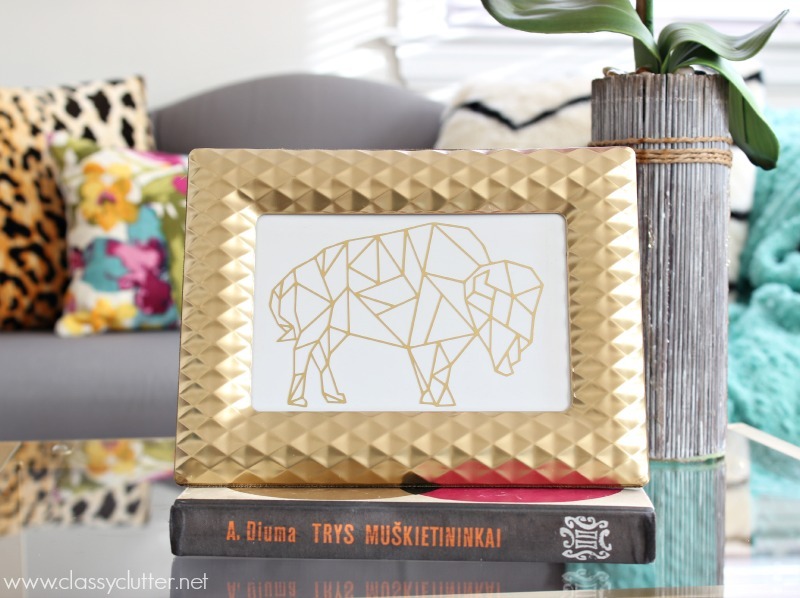 I found this geometric buffalo and I KNEW that’s what I needed. If you didn’t know, I live in Buffalo, New York so this was a no brainer. It’s stylish and quirky and has real meaning to me. Win, win, win! 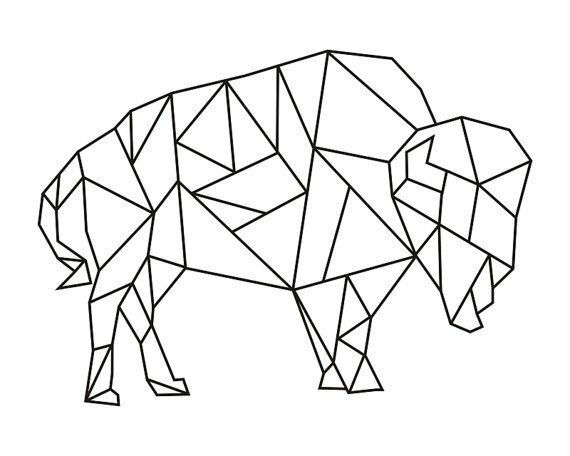 Download the geometric buffalo image here. Next, open your Silhouette Software and import your image. To do this, click on File > Open > select your image you want to import. If you don’t have a Silhouette machine, you can still download and use the software then cut the designs out with an exacto knife. You will want to choose a simpler design if you’re doing this but you can for sure still do it by hand. You may also purchase an image in the Silhouette online store or you can do a typography print and just use fonts on your computer. Whatever floats your boat! 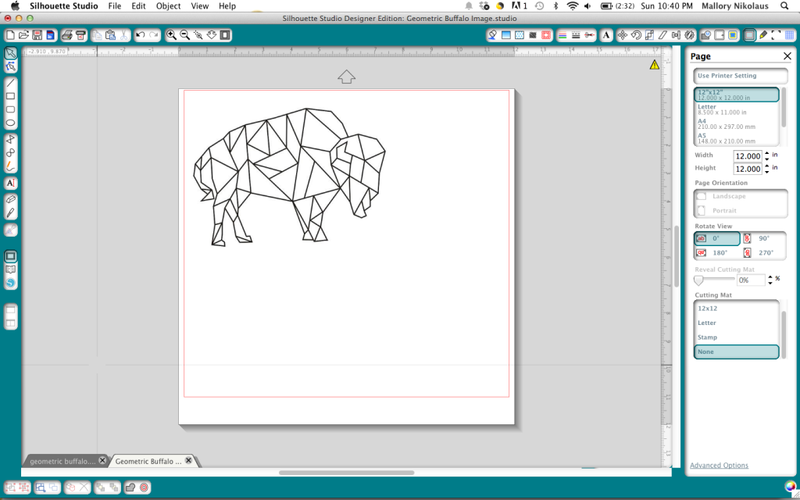 Next, use the Trace tool to make your own cut shape. 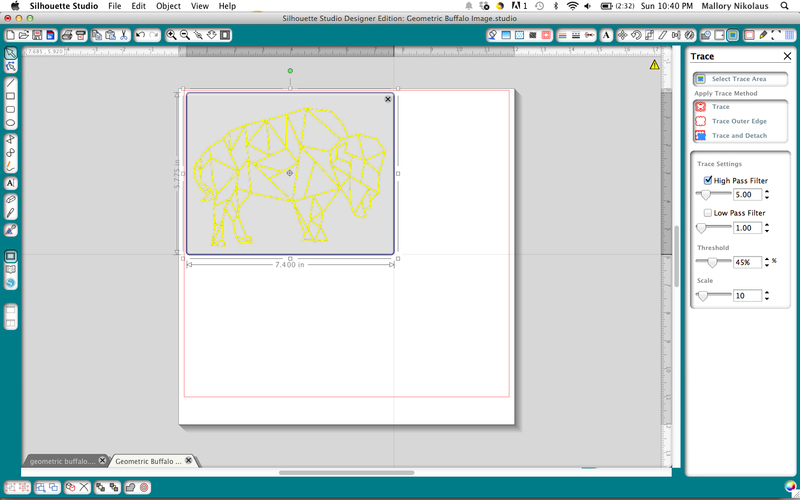 Click on Select Trace Area and highlight around your shape. Then, adjust the settings to make sure your entire image will trace. I cranked my High Pass Filter all the way up. Click Trace and voila! There’s your buffalo ready to cut! 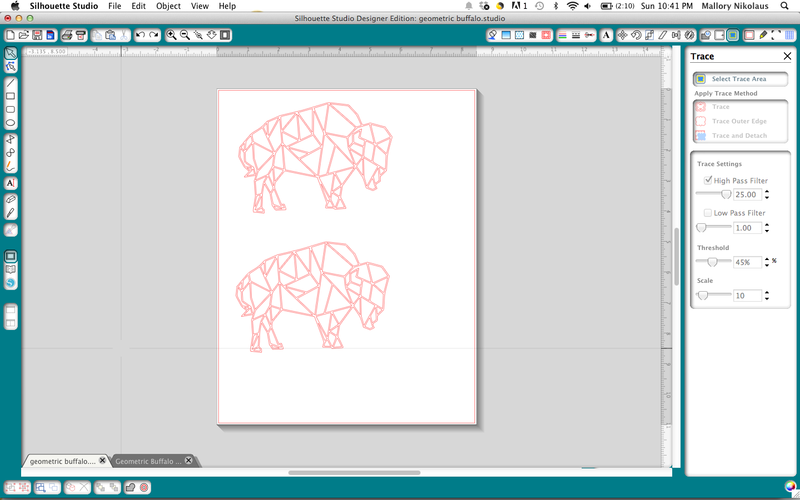 Next, I erased the .jpg image (the black one) from my workspace and copy and pasted the buffalo cut shape (the red one) as to have two on one sheet. I did this so I didn’t waste some of the foil and I like to have a back up cut of my shape in case I made any mistakes since I was just experimenting with the Printable Gold Foil product. 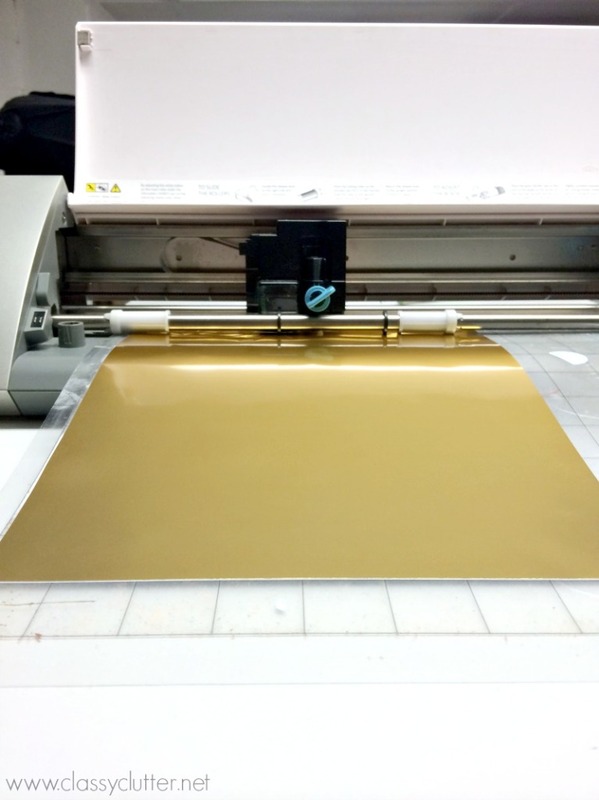 Next, apply a sheet of Printable gold foil on your cutting mat and load it into your machine. Be sure to double and triple check your settings before pressing cut. 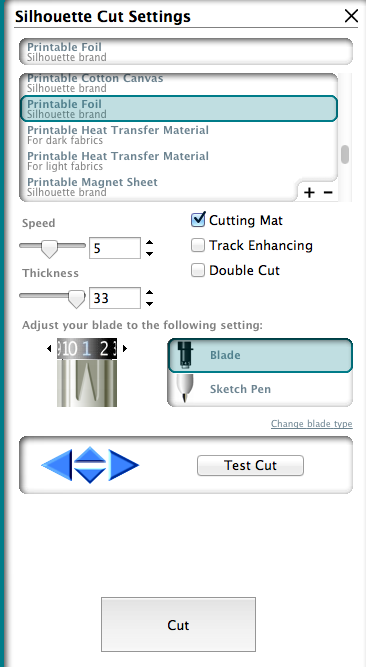 I selected Printable Foil, check the cutting mat selection and made sure my blade was set to “1” on my machine. If you haven’t used this before and want to double check, do a test cut first. Then, once everything is ready to go, click Cut. Once your shape is all cut out, all you have to do is peel it off and stick it on a white sheet of cardstock. Make sure it is cut to the size of the frame you’re going to put it in. 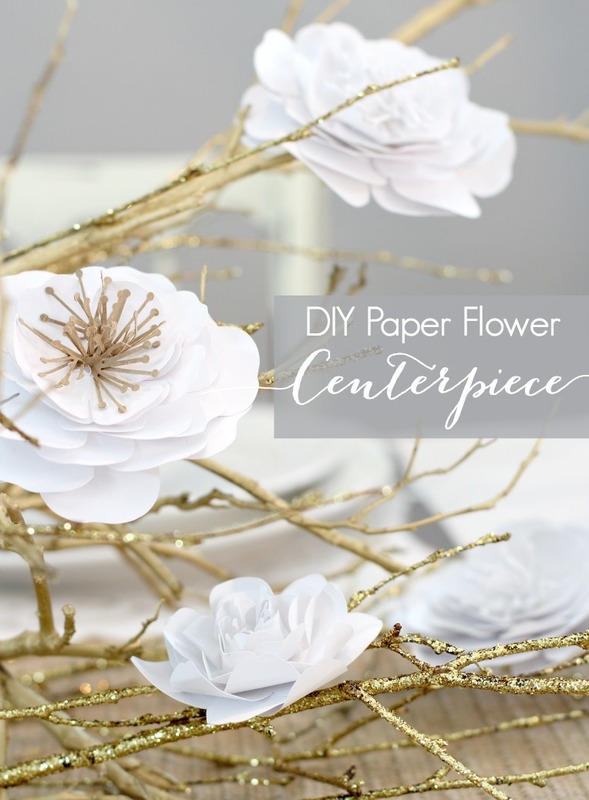 You do not need transfer paper for this unless maybe you’re doing a word or you have a very intricate shape. Since I was just using the outline of the buffalo (not the geometric shapes inside) I just peeled and stuck it on a 4×6 piece of cardstock. 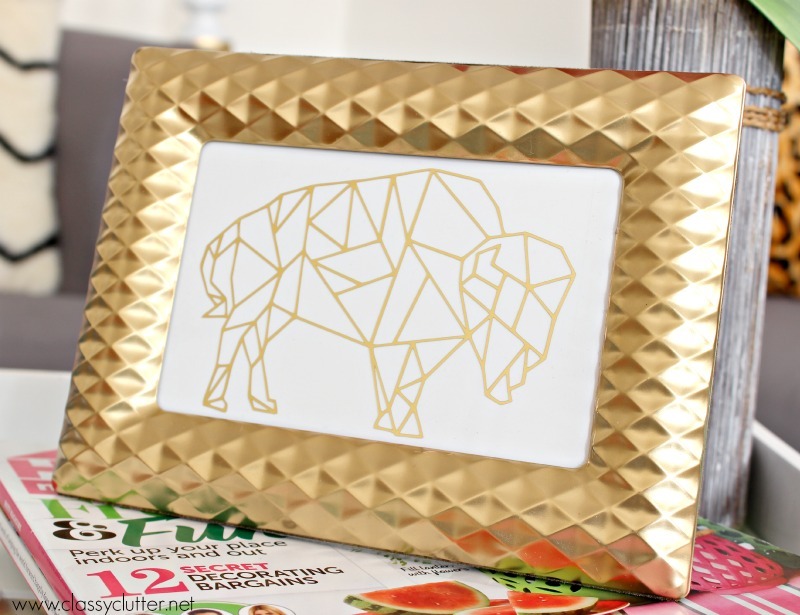 Place your foil shape and cardstock in your frame and ta-da! Looks like a custom gold foil print! This project only takes about 15 minutes and I love how it turned out. I love that the little Buffalo means something to our family but it’s also fun and stylish! Be sure and check out some other projects we’ve done with the Silhouette machine! Such a great idea for a handmade holiday gift! Great image! I’m loving finding all these Silhouette projects. Now I just have to narrow down my choices and make some of my own! 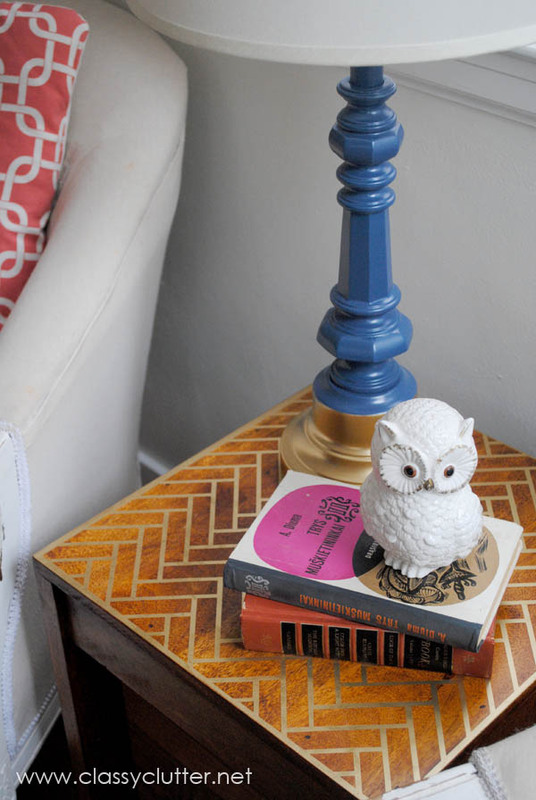 This is a fabulous project, and simple – my favorite kind!! 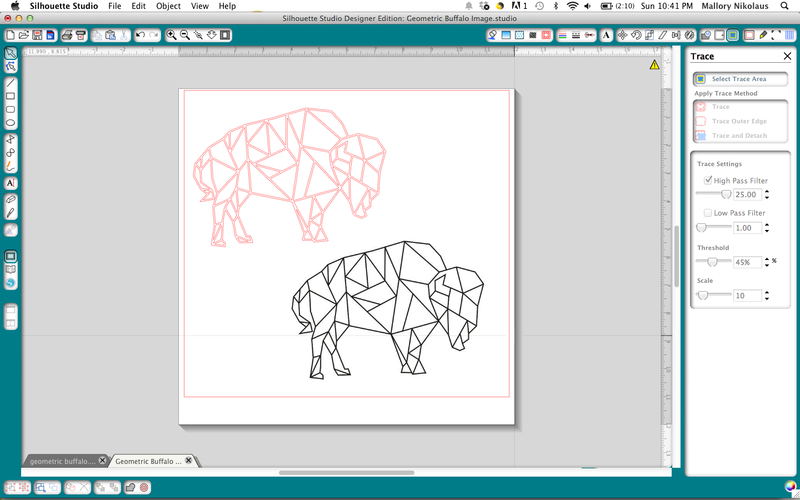 I have been crushing on geometric animal shapes lately, and I was thinking about either painting/embroidering/or just drawing one – but this is a great idea…too bad I don’t have a vinyl machine!! Did you post the winner of the awesome Silhouette giveaway? I take it that it wasn’t me, dang it! LOL!!! Have a great day!! It’s actually very, very simple if you use the Silhouette! It took me about 5 minutes!